It turns out that there is an exact mathematical relationship between pH and carbonate alkalinity for any aqueous system in equilibrium with the atmosphere. In this context, carbonate alkalinity is defined as the alkalinity provided by carbonate and bicarbonate, and does not include the minor contributions to alkalinity provided by borate (B(OH)4–), silicate (Si(OH)3O–), phosphate (H2PO4-, HPO4—, and PO4—), hydroxide (OH– and MgOH+) and the negative contribution from protons (H+, HF, and HSO4–). 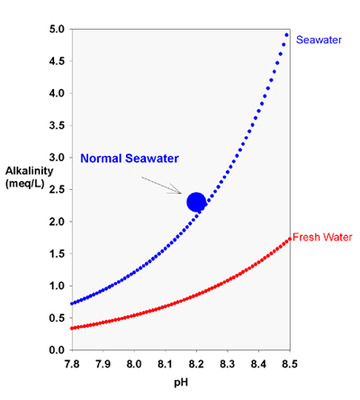 In normal seawater at pH 8.0, the carbonate alkalinity accounts for 96.5% of the total alkalinity, so for most purposes, the contributions from these other ions can be ignored. Two situations where they cannot be ignored, however, are when borate is artificially high, as is true in some commercial salt mixes, and when one is consideringthe buffer intensity, where borate is significant even in normal seawater (discussed below). where pCO2 is the concentration CO2 in the air. Current carbon dioxide concentrations are around 350 ppm and have been rising with time, from less than 300 ppm in preindustrial times. KH is the Henry’s law constant for CO2 (which describes the solubility of CO2 in water from the air to form carbonic acid, H2CO3), K1 is the first dissociation constant for H2CO3 (describing the dissociation of H2CO3 to HCO3–), and K2 is the second dissociation constant for H2CO3 (describing the dissociation of HCO3– to CO3—). A third feature of this relationship involves the pH of seawater as the ambient CO2 level rises. If CO2 is allowed to double (Figure 2), the pH drops by 0.3 pH units (assuming that the alkalinity is unchanged). Consequently, in the future, the pH of seawater may actually drop into the upper 7’s from the 8.0 to 8.2 range present today. At the start of the last section, it was pointed out that “_there is an exact mathematical relationship between pH and carbonate alkalinity for any aqueous system in equilibrium with the atmosphere_”. An important point to keep in mind is that the relationship will be altered slightly if the tank is not in equilibrium with the air. Specifically, reef tanks are often not in equilibrium with the air, making the internal pCO2 for the tank something different than the surrounding air. For example, tanks using limewater can have a pH value of 8.5 with a total alkalinity of only 3 meq/L. 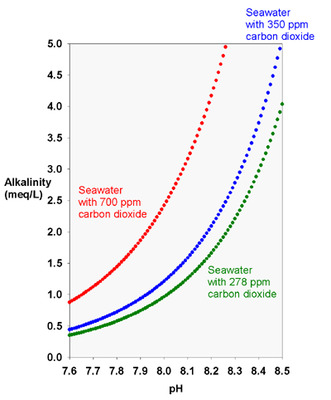 Looking at Figure 2, this puts them off of the theoretical relationship for seawater in ambient air. The fundamental explanation is that the tank is deficient in CO2. In effect, the tank has an internal pCO2 that is more like that for the preindustrial air with 273 ppm CO2 (Figure 2). In this case, driving more CO2 from “normal air” into the water would lower the pH to about 8.2-8.3 while maintaining the same alkalinity. Likewise, tanks that use calcium carbonate/carbon dioxide reactors often have a pH of 8.0 with an alkalinity of 3 meq/L (or more). Again, that set of values falls off of the theoretical curve shown in Figure 2. In this case, the tank has an artificially high internal pCO2 of more than twice “normal air”. Driving more CO2 from the tank into “normal air” would raise the pH to about 8.2-8.3 while maintaining the same alkalinity. A third way that reef tanks can present unusual combinations of pH and alkalinity is if the tank is in an environment where the ambient CO2 is far from normal. Rarely would such a situation involve reduced CO2, but homes and businesses are frequently elevated with respect to CO2. Such levels as those represented by the 700-ppm line in Figure 2 are frequently encountered by aquarists, especially those living in newer, “tighter” homes (and some have proven this fact to themselves with carbon dioxide detectors). Aquarists that experience chronic low pH despite adequate alkalinity and aeration may do so because their homes have such elevated levels of carbon dioxide. Many of these aquarists have found that the pH of their tanks rises substantially by simply leaving a window near the tank open to permit better exchange with exterior, “normal” air. For all of these reasons, a tank may move between the red and green lines of Figure 2 (or further in extreme cases) without the alkalinity changing at all. Typical diurnal pH fluctuations in a reef tank (and in some natural lagoons, for that matter) are about 0.1 to 0.3 pH units. For tanks with a larger fluctuation than about 0.3 pH units, the aquarist might want to look for ways to minimize the fluctuation. This minimization is best accomplished by maximizing the gas exchange between the tank and “normal” air through better circulation, better aeration through devices such as skimmers, having part of the tank system, such as a refugium, on a reverse photocycle so some organisms are always photosynthesizing, or by more rapidly exchanging the room air with exterior air. One can also impact the diurnal pH fluctuation by adding high pH additives (like limewater or other high pH alkalinity additives) during the nightly pH minimum, and by adding low pH additives (like sodiumbicarbonate) during the daily pH maximum. Buffer and buffering are terms that are thrown around indiscriminately in the world of reefkeeping, and the actual meaning of these terms is often lost. Many aquarists refer to any alkalinity supplement as a buffer, but this isn’t the case. For example, neither sodium bicarbonate nor sodium carbonate, taken alone, is a true buffer. Here’s what is happening on a chemical level. When a base (such as OH–) is added to the system (in an effort to raise pH), some of the bicarbonate is converted to carbonate. This process effectively “uses up” some of the OH– that was added, and the pH does not rise as much as it would without the “buffer”. When an acid (H+) is added to the system (in an effort to lower pH), some of the carbonate is converted to bicarbonate. This process effectively “uses up” some of the H+ that was added, and the pH does not drop as much as it would without the “buffer”. Of course, in order for this process to buffer against both pH rises and pH drops, there must be a significant amount of both HCO3– and CO3— present. At about pH 8.9 in seawater at 25 °C there are equal concentrations of HCO3– and CO3—. At lower pH, there is less CO3—, and at pH 8.0 there is really quite little carbonate in seawater (only about 4% of the bicarbonate level). Consequently, seawater is not especially well buffered against substantial pH drops when the pH is already less than 8.0. It is, however, well buffered against substantial pH rises. The difference in the buffering against substantial pH rises and drops is obvious from such an experiment. Nevertheless, there is much more to fully understanding how a buffer works. Chemists have chosen the term “buffer intensity” (symbolized by b) to reflect the buffering capacity of a solution at any given pH. While it has an exact mathematical definition, it is beyond the scope of this article to describe b in detail. There are, however, a few details worth mentioning in the context of reefkeeping (with additional details are provided in “Aquatic Chemistry Concepts” by James Pankow). Other, more esoteric tidbits arise from this system as well. For example, while the buffering against substantial changes can be different in the two different directions (as shown experimentally above), the buffering against very small changes is necessarily exactly the same. That’s what b represents: the buffering against infinitesimally small changes in pH in either direction. b changes as a function of pH, and is maximal when the concentrations of the two forms of the buffer (e.g., bicarbonate and carbonate) are equal. In seawater, b is locally maximized around pH 5.8 where the buffer is H2CO3/HCO3– and at pH 8.9 where the buffer is HCO3–/CO3— (ignoring the fact that other things happen at high pH, like precipitation of magnesium hydroxide and calcium carbonate). These are the points where seawater is most resistant to changes in pH as acid or base is added. Unfortunately, reef tanks arenot usually kept at those pH values, and so the buffering effect of the carbonate system is not as effective at holding pH steady as it might otherwise be. For this discussion, let’s presume that we want to supplement the carbonate alkalinity of a reef tank. That is, in the end we want to increase the bicarbonate and carbonate levels in the tank. There are a variety of ways to achieve this end, and these different ways have different immediate impacts on pH. Three of these ways (and combinations thereof) are fairly common in reefkeeping. These ways are addition of bicarbonate, carbonate, and hydroxide. In a reef tank that is permitted to equilibrate its total CO2 levels with the atmosphere, these additions all end up with the same final pH. That is, it is only the amount of alkalinity added that determines the final pH, not the nature of the additive itself. Here’s how to think of these additions. When these chemicals are added to the water, there is a change in the relative concentrations of carbonate and bicarbonate, and it is the ratio of these two ions that determines the pH. The net effect is that the pH rise that is normally encountered by adding hydroxide to water is reduced. For example, adding 0.5 meq/L of hydroxide to freshwater would drive the pH into the 10’s. In seawater, the pH rises much less, and the conversion of bicarbonate to carbonate is largely responsible. Two texts that provide additional detail on this subject are shown below. Millero’s book is especially suited to seawater, but isn’t as detailed or mathematical as Pankow’s.